DBS. 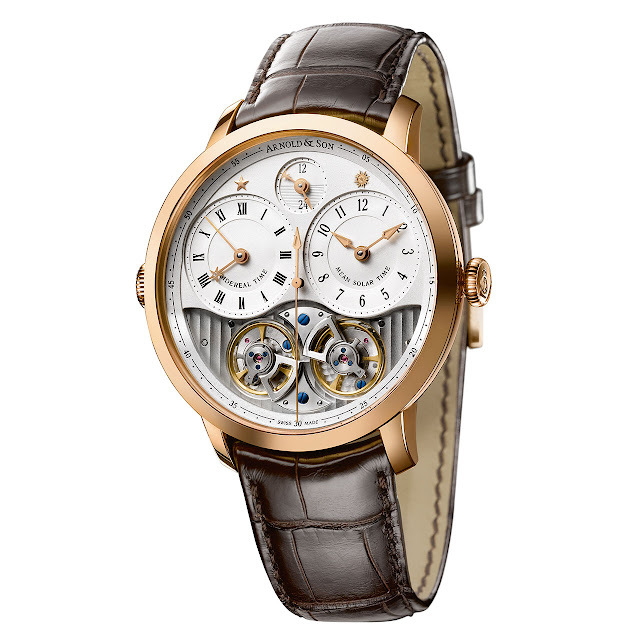 Three initials that pay tribute to the heritage and expertise of Arnold & Son, once again placing the brand in the forefront of horological complications. Sidereal time and mean solar time (local time) appear side by side on the same dial. Between 1796 and 1799, John Roger Arnold achieved considerable feats in this field, now echoed two centuries later by the brand bearing his name. This timepiece featuring perfect aesthetic and mechanical symmetry bears two independently operating counters. Powering these two entities is an entirely in-house designed, developed and produced “mirror-type” calibre. It comprises two balances and two barrels – one running at a 24-hour speed and the other at 23 hours, 56 minutes and 4 seconds. The openworked dial provides a clear display of the two mechanisms operating side by side without interfering with each other. Doubtless liable to propel aficionados into even higher orbit are the sidereal and solar indications appearing at 12 o’clock and which are read off in 24-hour mode.